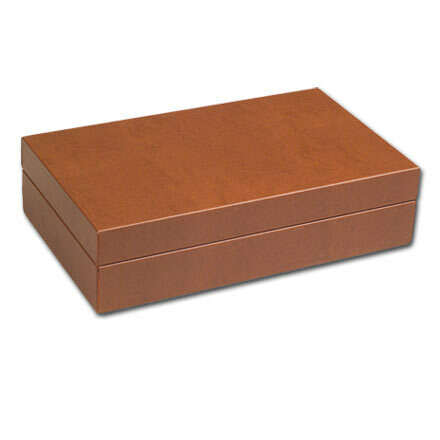 Leather Firearms Box | Custom wood boxes and cases. Made in the USA. Produced as a leather box for a firearms manufacturer, this simple, streamlined box possesses an understated look, backed by Pocumtuck's longstanding tradition of quality. Custom-fitted nylon velvet interior makes it a worthy home for collectibles. Tailored leather exterior lends to a seemless look of understated quality. Solid wood construction with particle board options for cost effectiveness. 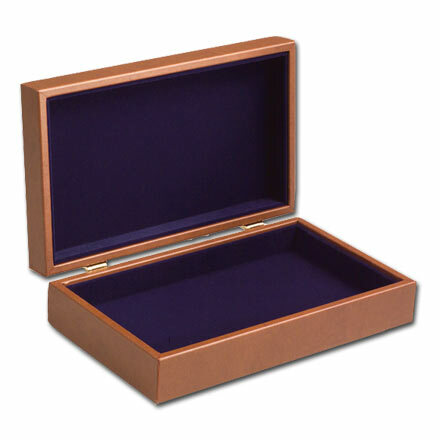 Customization options for similar box designs could include embossing with logo or branding message or gold foil stamping. Made in the USA.